A friend refers this book to us saying that it is a good read but at the same time it is highly disturbing. So we order the book out of high curiosity. The book arrives and we began reading it just to realize that the book will need a lot of concentration and a vast range of philosophical inclinations. 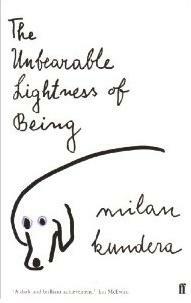 Although the book is very simple in its language, author Milan Kundera, who is of Czech origin living in France, writes with a lot of open-ended thoughts that will allow you to relate and explore the idea mentioned. ged son from an earlier marriage. These characters meet each other at some point in their lives and discover and un-learn a lot of things that they have either presumed or carry baggage of since childhood or otherwise. The characters are easy follow even if their lives are interconnected and not jumbled. The Book is free flowing as it gives you apt references without you needing to turn the pages backwards. Book Review: And The Mountains Echoed – Heart-breaking, Sadness, Despair! An Unequal Harmony – Light Read, Yet On A Serious Subject!